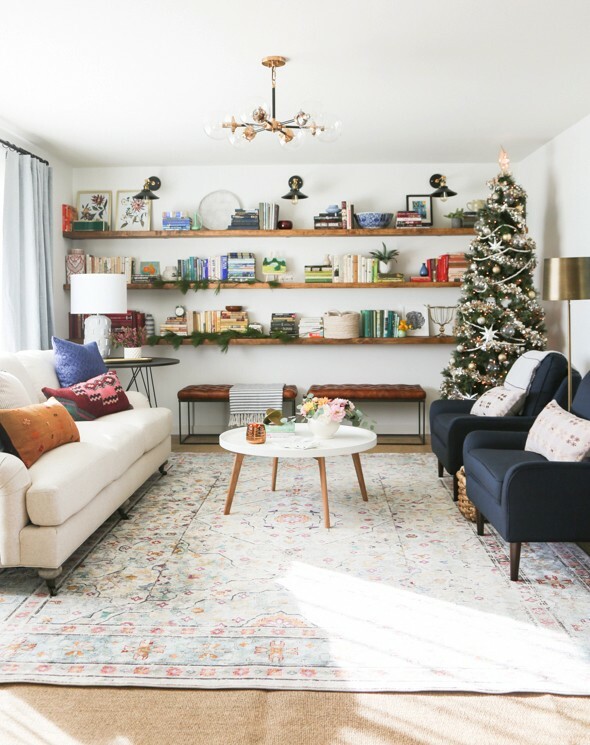 REVEAL: #JuniperStudioDeckMyHalls Living Room Giveaway with Overstock! Eeeeeeeps!!!! 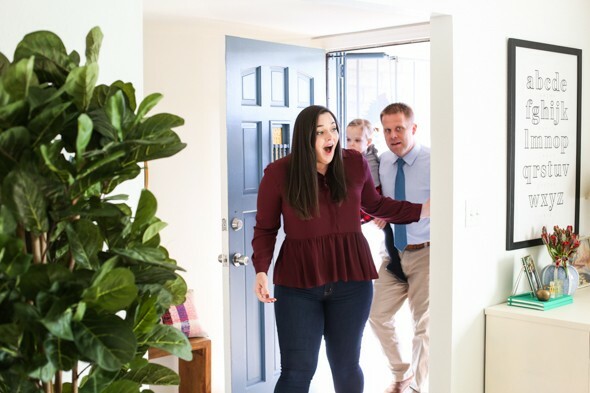 I’m bursting with excitement over here because on Monday we gave a beautiful, sweet family a brand new living room, dining room, entry and kitchen makeover!!! Here’s a little back story: In early November I sat down with my team and we talked about how everything was going after moving to the new studio space and with all the additional projects we took on this year. It’s been SO good and fun, but admittedly, it’s been a little crazy. We brainstormed some ways we could edit a little for next year and refocus on the areas of the business that are the most rewarding (and fun!). We thought it would be so great to do something now in 2017 to sort of wipe the slate clean in preparation for the new year’s mentality. We came up with the idea of doing a huge, HUGE giveaway for a local family for the holidays. I mean, what better way to press the reset button than to figure out a way to give back, right? We were all VERY excited. 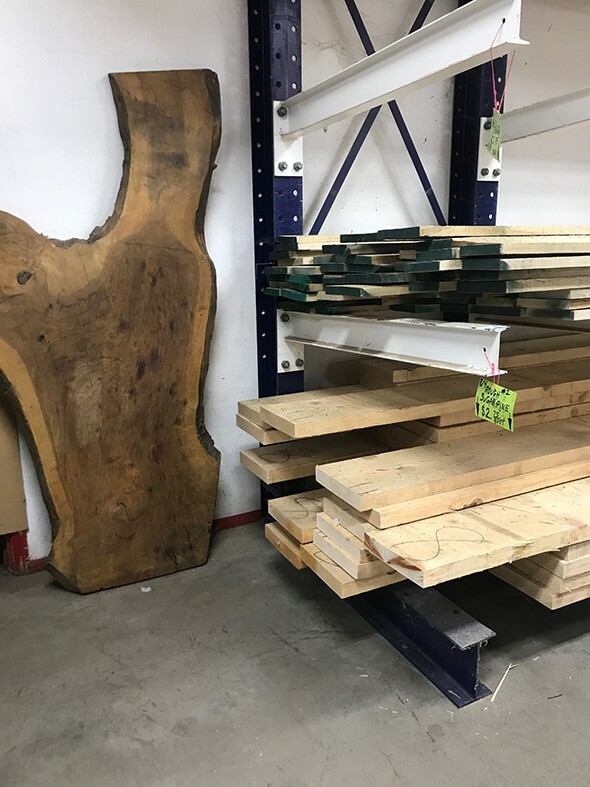 I knew we could handle everything with the design and renovation work but that we were going to need some help getting a lot of the furniture together in time for a reveal before the holidays. 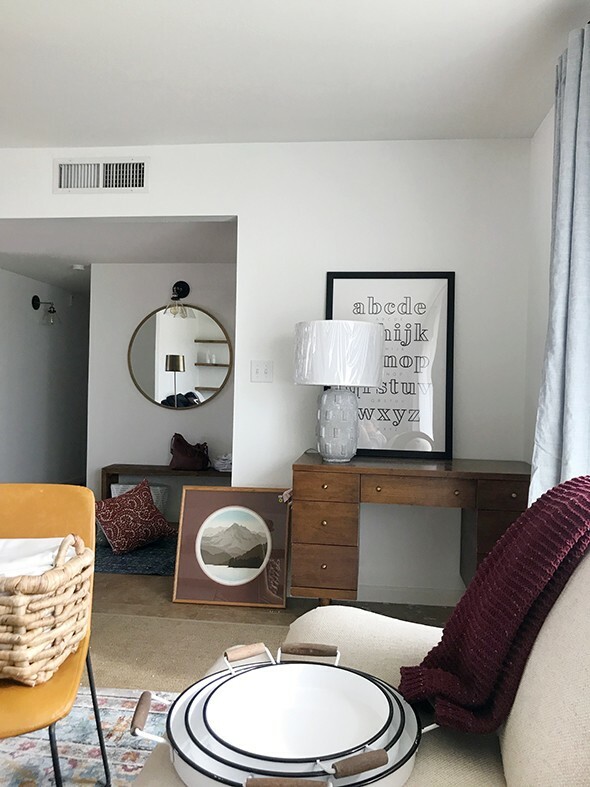 I loved working with Overstock.com for their Design Challenge and #OverstockStyle Weekend and they obviously have the most ENORMOUS selection of beautiful furniture, that can adapt to any style, which was a must for a project that had to adapt to fit every family that entered. I crossed my fingers and toes and emailed them to see if they would be up for donating the furniture for this giveaway and Overstock was as excited about giving back as we were. I knew we had found the right partner! They have truly been amazing to work with this whole project. 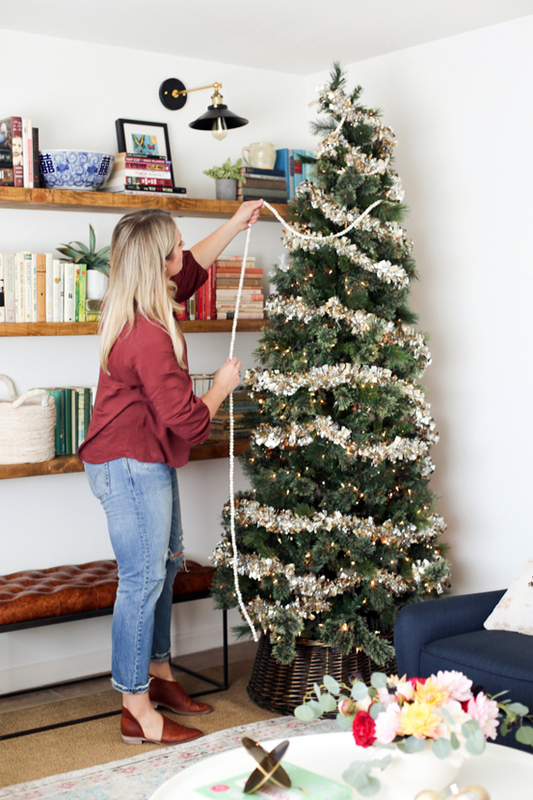 Asking a team to rush a whole house worth of decor and furniture during the holidays is such an oversized request, but they (literally) delivered in every way. Yay Overstock! When it came to picking a winner, our team combed through the hundreds and hundreds of local applications through Instagram and talked for DAYS about each of your beautiful posts! (We laughed, we cried, we want to be your real life friends.) There were so many that we loved and that we wanted to help with! In the end, each of us on the team picked three applications (and, to keep things fair, they couldn’t be people we were related to or that we knew well) and then the final winner was selected at random. The family whose name was drawn turned out to be the SWEETEST, most gracious people in the whole wide world. They could not have been easier to work with or more grateful! They are both teachers and they recently bought this cute little ranch home. They put in a new kitchen after moving in, but they were ready for some additional updates and new furniture and lighting! We met with them, took some measurements and notes about what they wanted in their new spaces and then we were off! We made our design plan, ordered all our items on Overstock in a snap and then it was time to get to work! 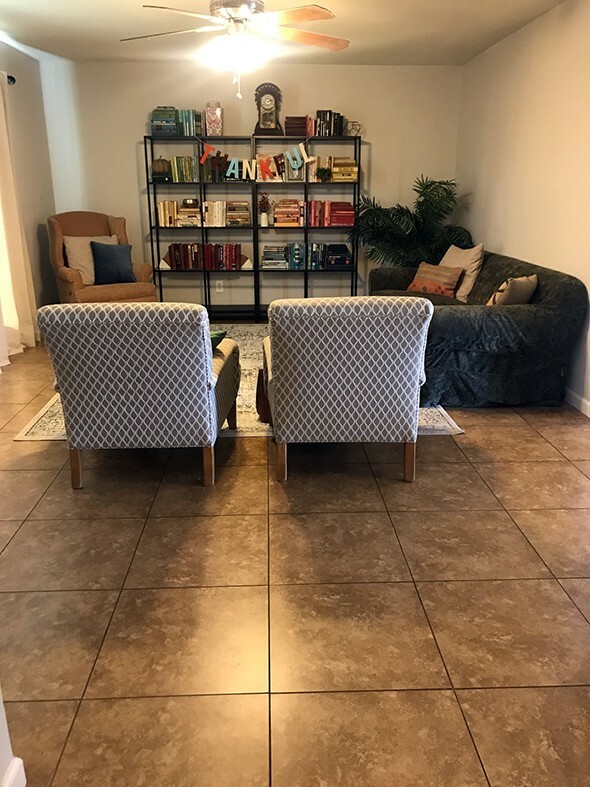 For starters, the homeowners don’t love their tile floors, but we had some good tricks up our sleeves for making the tile less of a focal point in the space and I think we really pulled it off! The color of the walls was a good starting place. 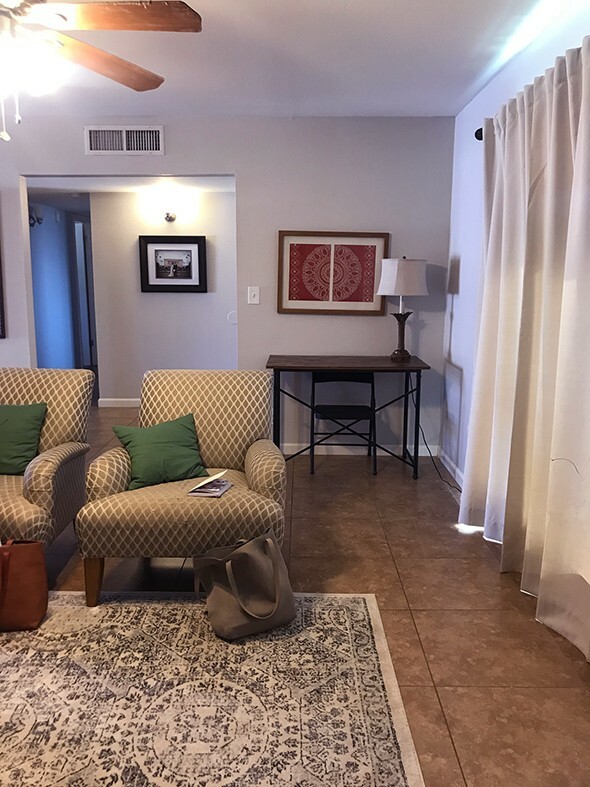 They had picked a really pretty bluey-gray wall color when they moved in, but it seemed to only exaggerate the yellowy-brown color of the floor. So we painted the walls a bright, clean white and instantly the floors felt more neutral! 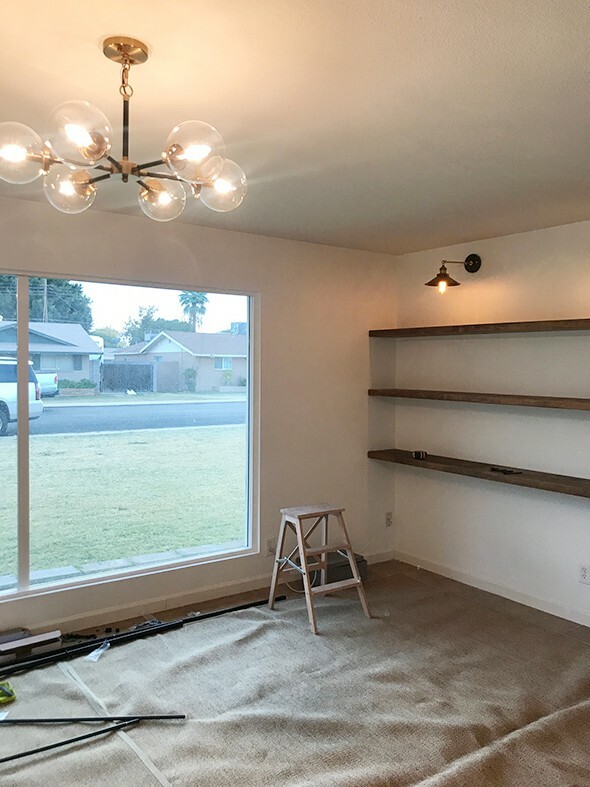 After the walls were painted, I got to work installing floating shelves in the living room. 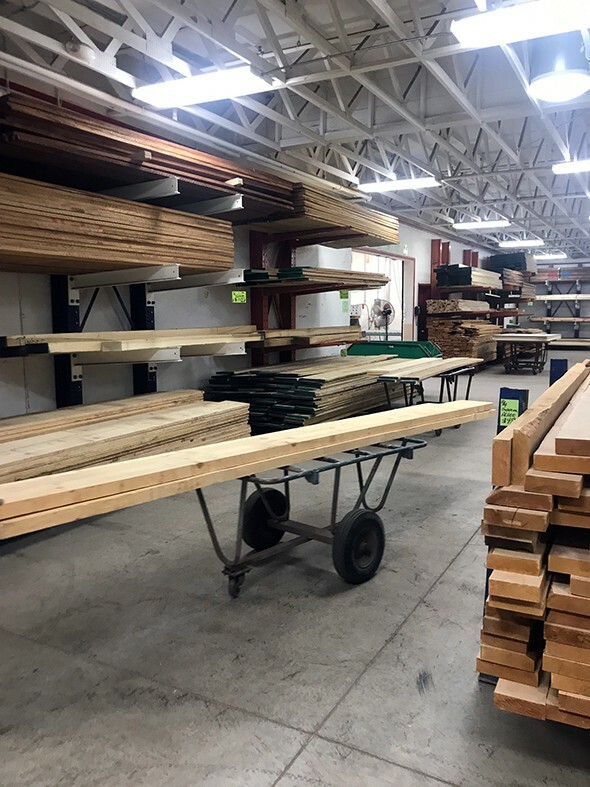 I recently discovered a local lumber yard (Timber in Mesa) and realized how much better the selection was compared to the big box hardware stores! 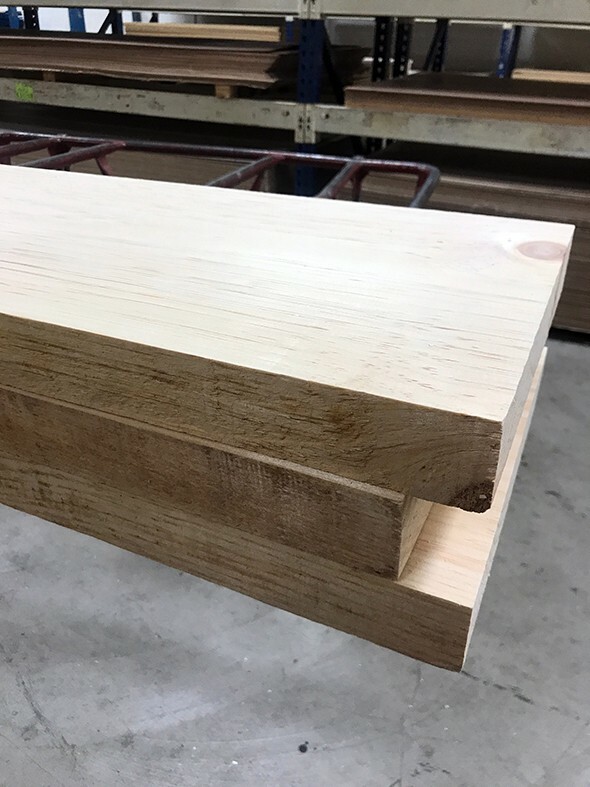 For just a little more than the cost of construction grade pine boards, I found 2″ thick boards of 14′ long pine that were perfectly straight and had a lot less knots. And best of all, the lumber yard milled and sanded the boards for only $20 extra! AMAZING. I picked them up basically ready to stain! 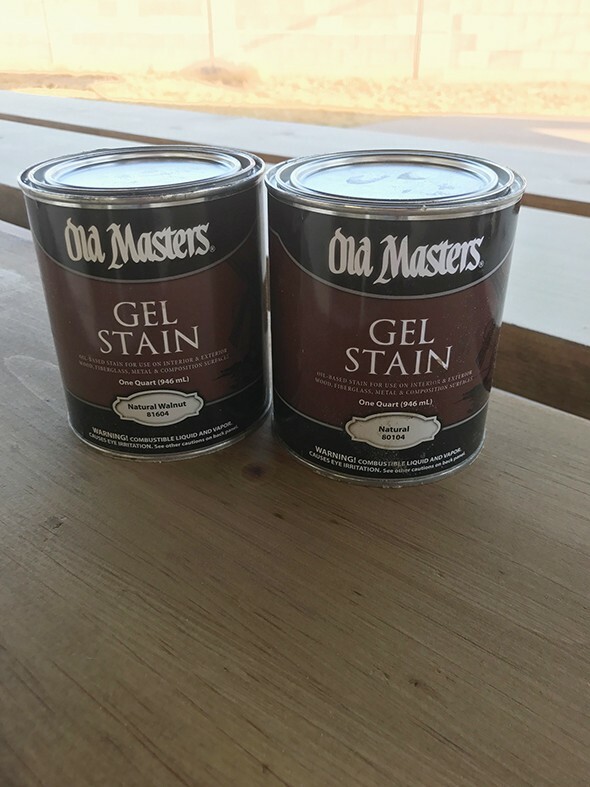 The nice people at my local lumber yard also recommended this gel stain for pine, which can be finicky about accepting stain evenly. Gel stain sits on top of the grain more and worked beautifully for this project! 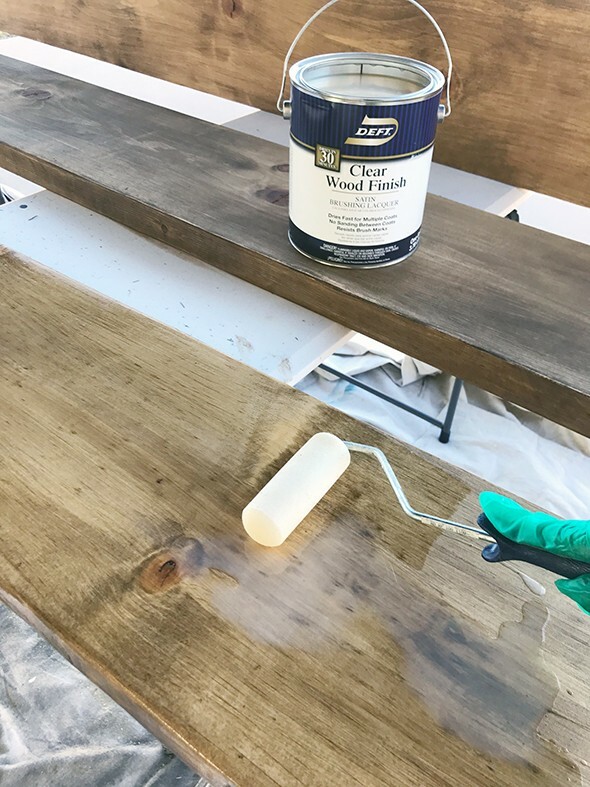 I used a clear sealer as a top coat and after a night of drying, the boards were ready to install! 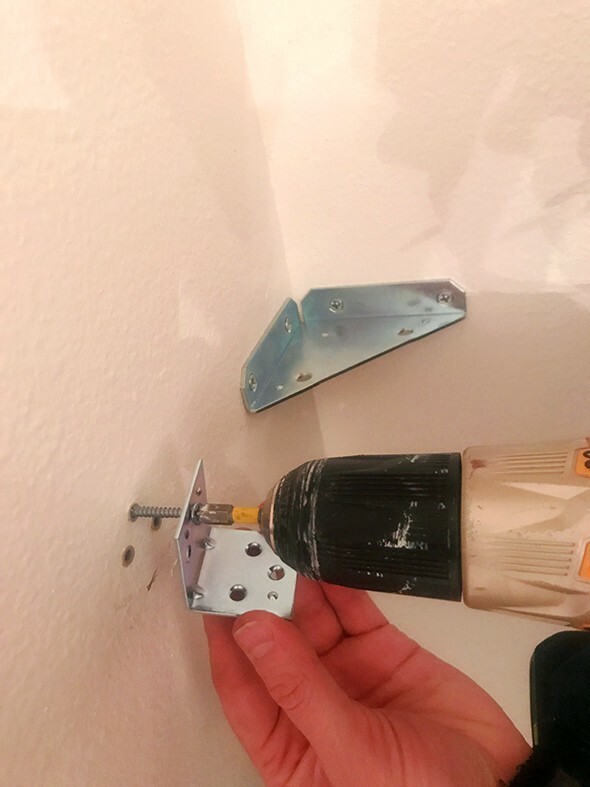 I picked up corner metal braces at the hardware store along with L-brackets. 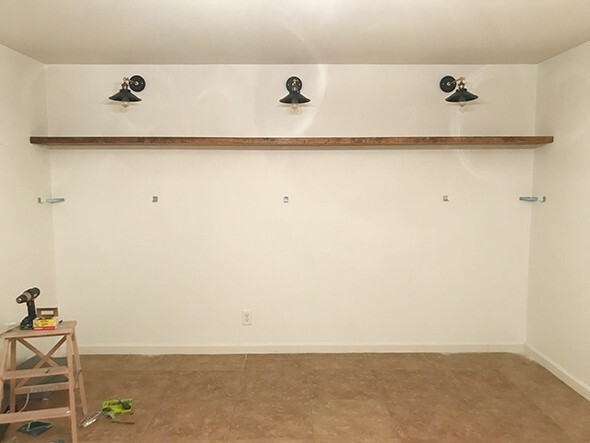 I found the studs and marked out my entire wall, drilled in the brackets, set the boards and secured the boards to the brackets by screwing them in place from underneath. Can I tell you, I was pretty confident this method would work well, but it worked SO WELL. Those heavy boards are so well supported and are so sturdy! You could only slightly see the metal braces from underneath the shelves when you were sitting on the sofa, so later we decided to touch up the brackets with a little bit of matching acrylic paint which helped a lot. 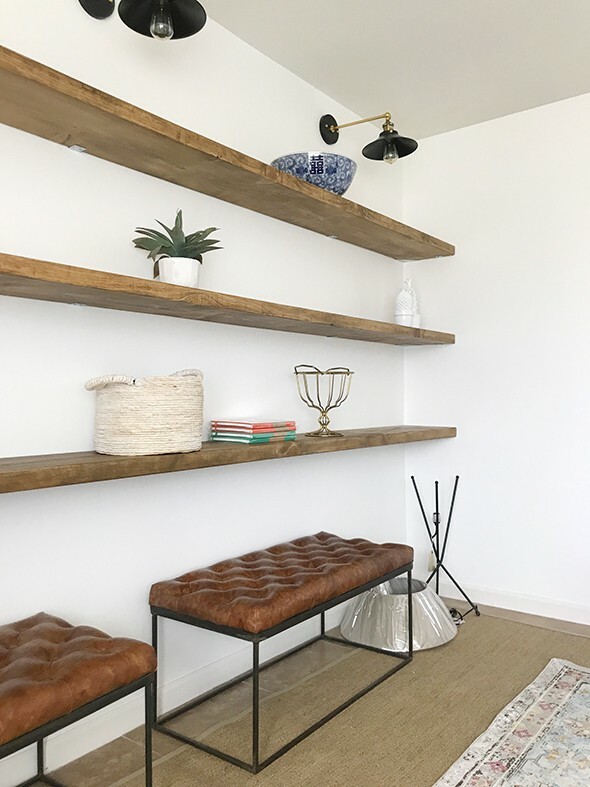 These shelves were such a win! I spent only a few hundred dollars in materials and Michael and I hung them together in a night. They make the space look so much more finished! And how about this new lighting?! Isn’t it amazing?! We hired an electrician to come in and install this chandelier and these three sconces along the bookshelf wall. I LOVE the look. Never underestimate the power of great lighting! 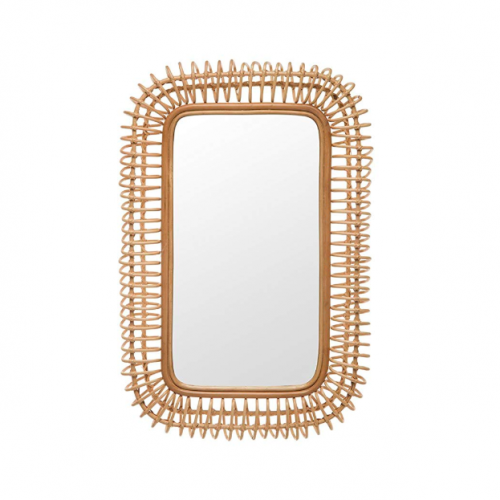 It’s even better when the fixtures are as affordable as these from Overstock! 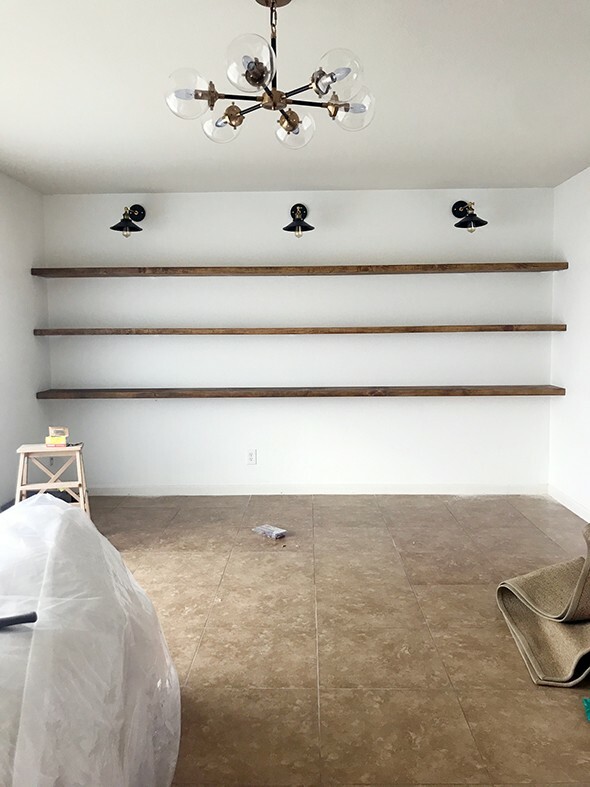 I was SO excited to style those shelves and get all the furniture moved in the next morning! And here is the gorgeous space now, after all of our Overstock finds were moved in! The sofa was our starting point for the design. Our homeowners wanted something a little more traditional but with clean lines. We found this BEAUTIFUL roll arm sofa from Safavieh on Overstock that is upholstered in a heavy weight oatmeal color linen. I have a similar fabric on my sofa at home and it has held up to my kids’ abuse wonderfully! One of my favorite things to do in a living room is to use one large round table with a big lamp rather than two small side tables. 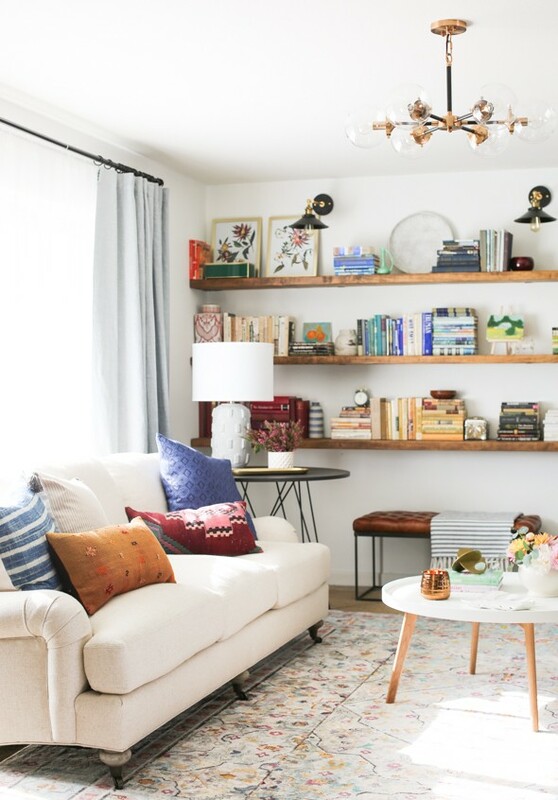 I think it adds interest and height to the space and helps break up the boxiness that can sometimes happen in a living room layout. 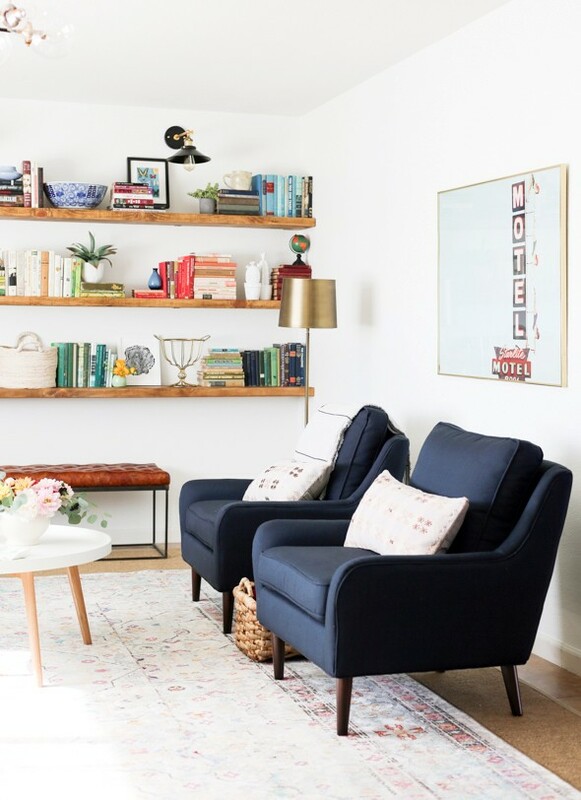 We used this small dining table from Overstock (with the coolest legs ever) and I love how it looks with our sofa while floating in front of the pretty shelves!! 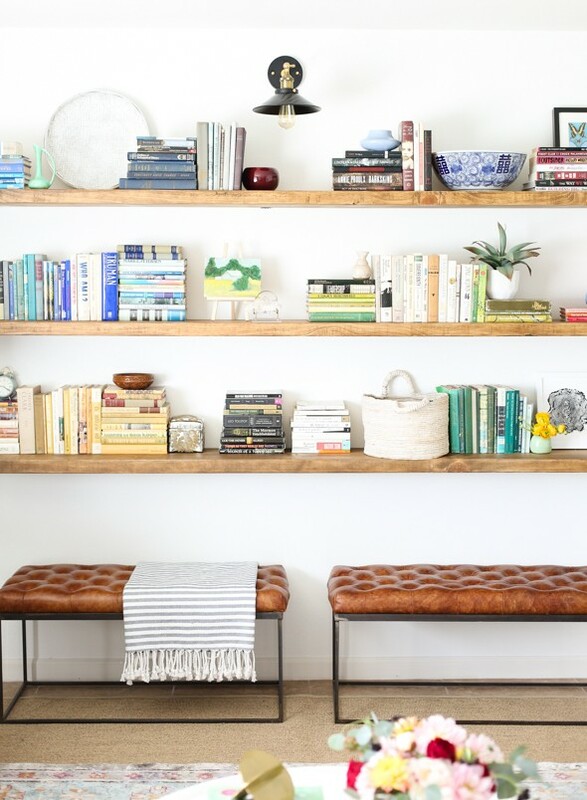 We also knew we wanted a few leather benches to layer under the new shelves. These tufted benches from Overstock with those gorgeous modern legs completely fit the bill! From there we picked a rug. This was another way we helped to minimize the presence of the existing brown tile in the room. We layered two large sisal rugs with this gorgeous 9×12 rug. 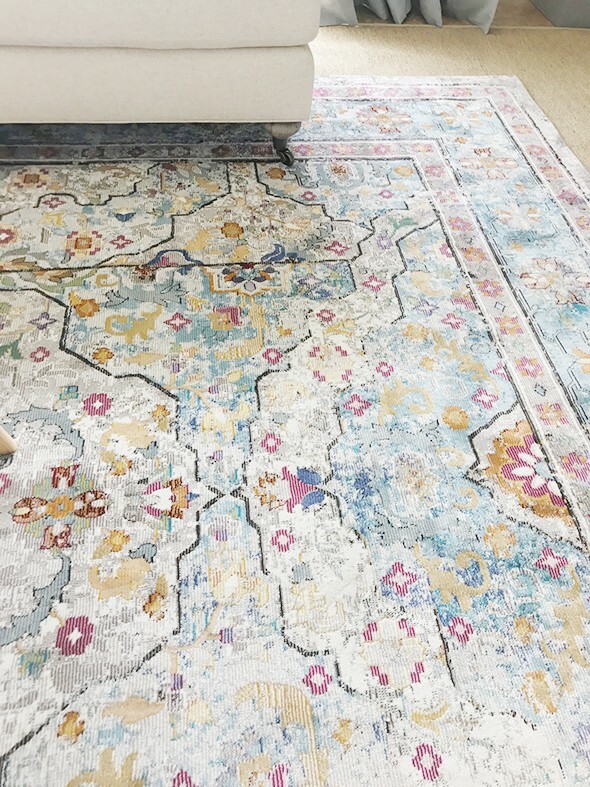 I LOVE all the colors in this pretty rug! I had my seamstress make the gorgeous blue linen blackout curtains and loose woven linen sheers. This large front window gets a LOT of full sun. The homeowners had only blackout curtains hanging here before which made the whole house feel dark. 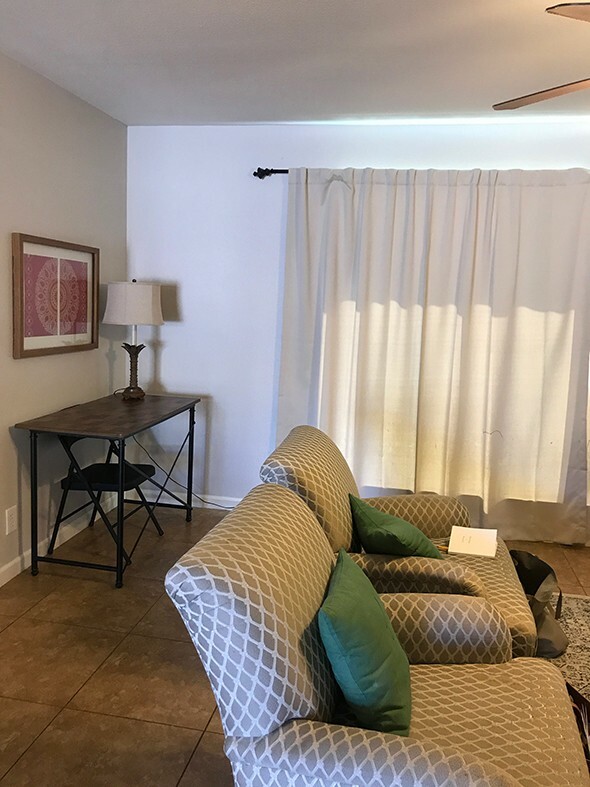 The double curtain rod that allowed us to hang blackout curtains and sheers together gave the homeowners a lot of flexibility and the most light and privacy possible. I love the look too! Isn’t that blue color so pretty? The circle shape ended up being a bit of a recurring theme in this home. 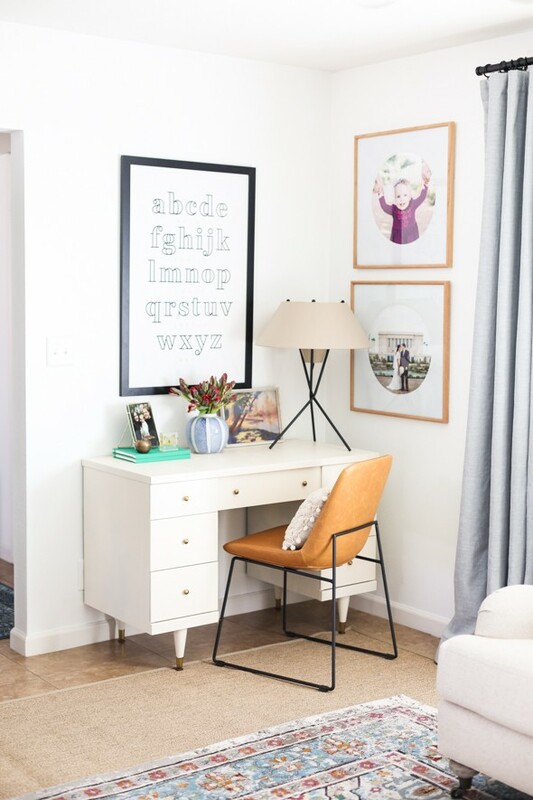 I found these vintage frames (you can see them in the first photo here below), sanded off the glossy finish on the frame and spray painted the old circle cut mats for a fresh new look! LOVE! 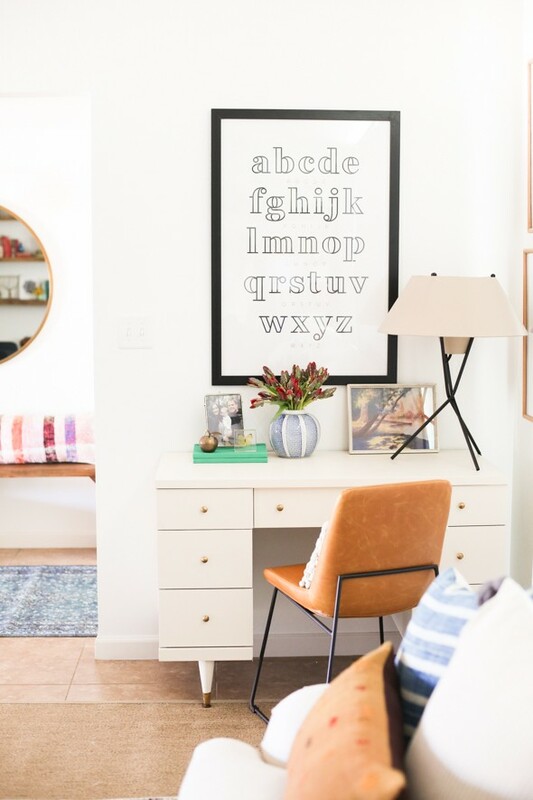 The homeowner sits at that desk every morning to teach English to online students, so she requested an alphabet print on the walls. I commissioned Angela Hardison, a local graphic design genius, to design it and she knocked it out of the park! The file is available today in the print shop! 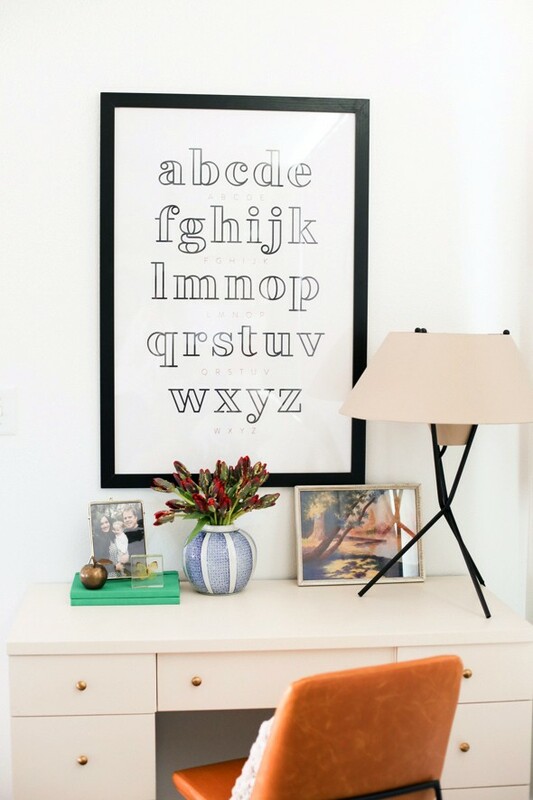 I love this for a children’s room or play space obviously, but I also love it for main living areas for a graphic pop! 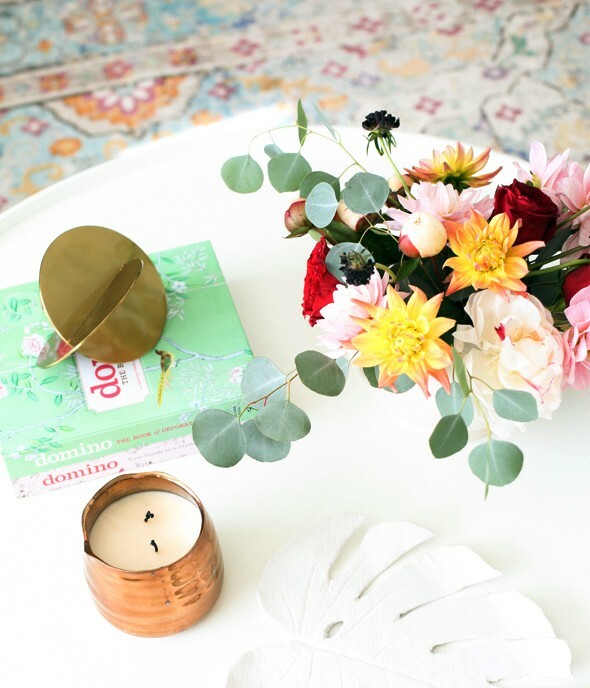 The desk was a vintage find that I painted off-white (the little brass knobs make my heart sing!). The desk lamp and leather chair were both Overstock scores. 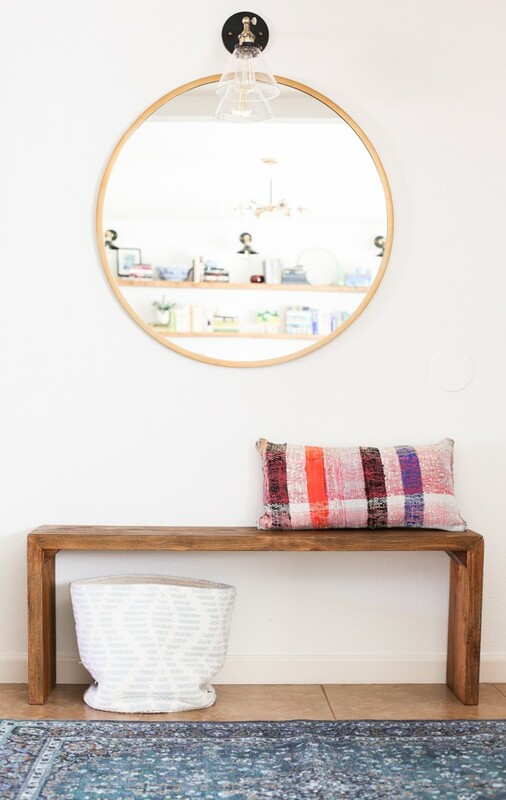 In the entry we had these gorgeous sconces installed and we hung a vintage brass mirror over my favorite wooden bench from Overstock. 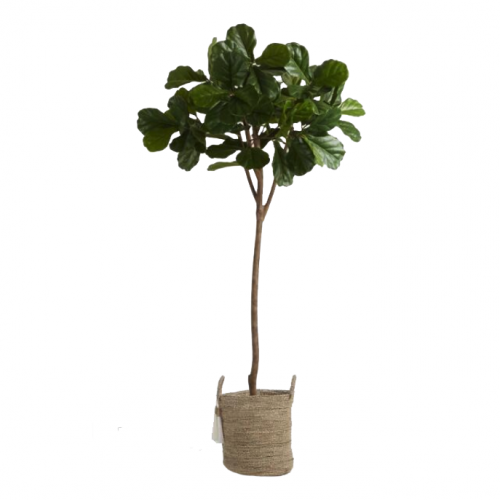 It has a slim profile and is PERFECT for small entry ways! I love it! I’m SO happy with how this giveaway space came together. It was one of those whirlwind/stressful/exhausting/completely amazing experiences that I will forever treasure! 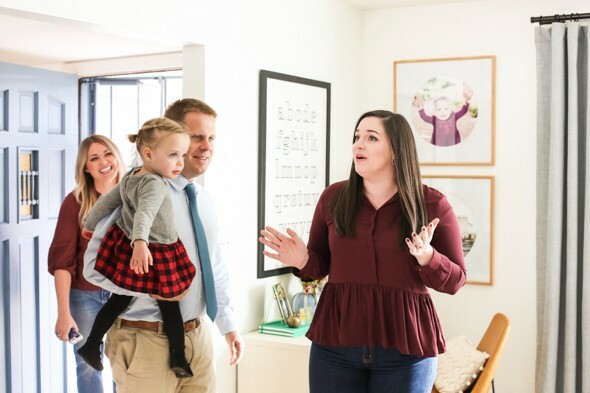 Seeing this sweet family’s reaction to the space was THE BEST. So many happy tears! Wouldn’t it be weird to walk in to YOUR OWN HOUSE and have everything completely changed? I mean, pretty cool, but also a little weird, right!? 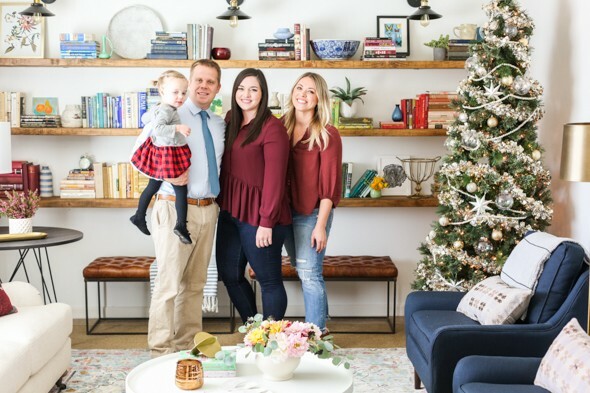 We tried hard to incorporate family heirlooms and colors and themes that were meaningful to this family so they could feel at home as soon as possible! We tucked some wood blocks in this little basket on the bottom shelf for their young daughter so would maybe be distracted by all the changes in her spaces for even a minute! :) Ha! She was a champ though and I think she liked it all as much as we do! Right before they got to the house for the reveal on Monday, we rushed to put up a Christmas tree and doesn’t it just complete the space? We couldn’t be happier for this sweet family! They were the best in so many ways and I hope they love everything we put in their new living room and entry! NEXT UP: the dining room and kitchen reveal!!!! This entire giveaway was made possible and sponsored by the EXTREMELY generous, kind friends at Overstock, a company I love and fully stand behind! Thank you, Overstock!! How beautiful and inspiring!! I wish I could transport the whole look to my house. I’m so glad you did this giveaway. This couple looks so happy, and I can only imagine the excitement and gratitude they feel. Love your design work Jenny! You have a gifted eye and vision. All your hard work and dedication to the trade really shows. Just wonderful, Jenny and Team! So happy this family gets such a lovely gift from you! People nollmray pay me for this and you are giving it away! She’s posted a few times-gift guide and insta. If I recall correctly fly they’re from anthro. They’re Free People! My favorite shoes!! You and your team are KILLING it. I just had to shout. Love it all. So thought out and perfect. 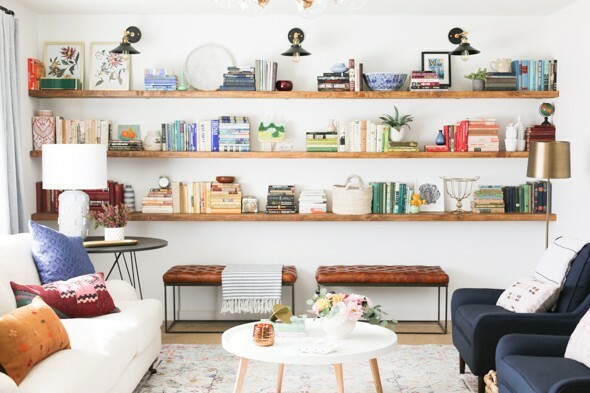 My favorite thing are the shelves. Chunky and delicious! I’m shkeocd that I found this info so easily. We detfiniely need more smart people like you around. So so great! The twinning outfits is awesome. Haha. Love how this room turned out! Such a wonderful way to give back! I’m sure they LOVE it! So inspiring, love these posts! So extremely good Jenny. I’ll be refreshing this page in excitement for the next reveal. I also already found a local lumber yard (with a mill shop) and am going to redo my my pantry shelves. Excited!!! 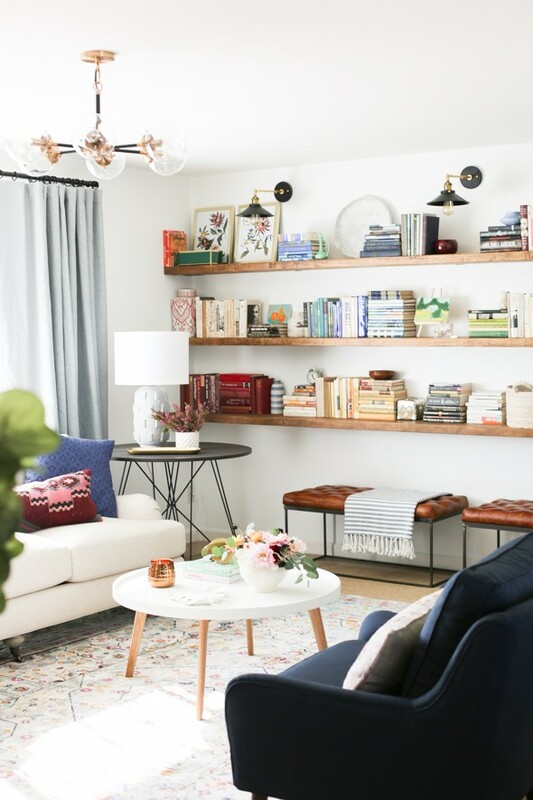 The living room looks amazing (especially those shelves!). What a wonderful way to give back… thanks for all your inspiration. Jenny, you are awesome!! What a beautiful space and a beautiful gesture! Overstock is amazing to give so generously. 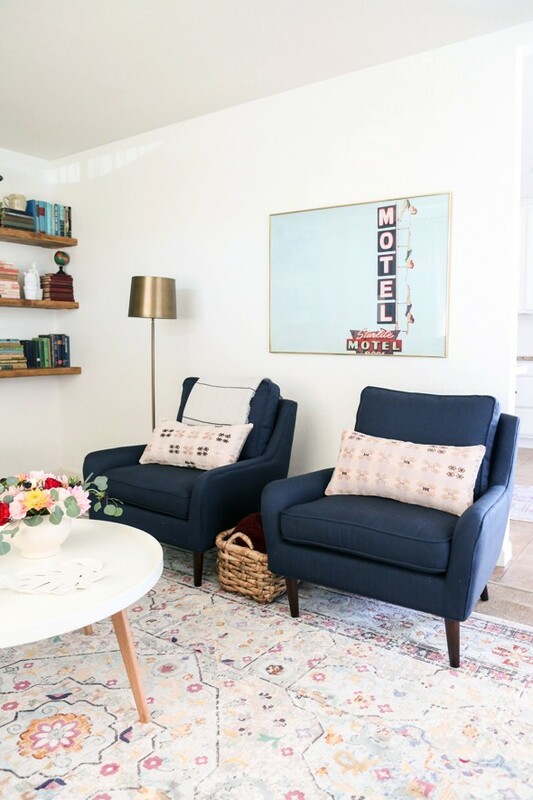 That rug… I am going to have to find a space in my house for it! Love it!! And the shelves, genius! Merry Christmas to your sweet family and team, Jenny!! Apaeiciptron for this information is over 9000-thank you! Those family photos in the frames with the round mats are awesome. Where are they from? You can see in one of the “during” photos a pair of vintage frames with mauve circle mats! I picked these up at a thrift store and cleaned up the wooden frames to make the stain look more natural and just spray painted the vintage mats with flat white spray paint! So easy! You can also easily get circle mats cut at Michaels or Hobby Lobby or a custom framing store for about $20 depending on the mat you pick and the size of the frame (these are 22″ frames with a 16″ circle FYI). I love how the circle matting makes family photos feel more artistic! Wait question! Did you clean the frames up with a natural colored stain? Love how those turned out! The word AMAZEBALLS comes to mind. You’re a magician. I love it. I love it! You and your team did a fabulous job. I’m sure it was a lot of work but the homeowners look thrilled and those of us who get to read about it on the interwebs are also thrilled. :) Merry Christmas and Happy almost-Birthday to Evie! This is crysatl clear. Thanks for taking the time! Bravo Jenny and team! 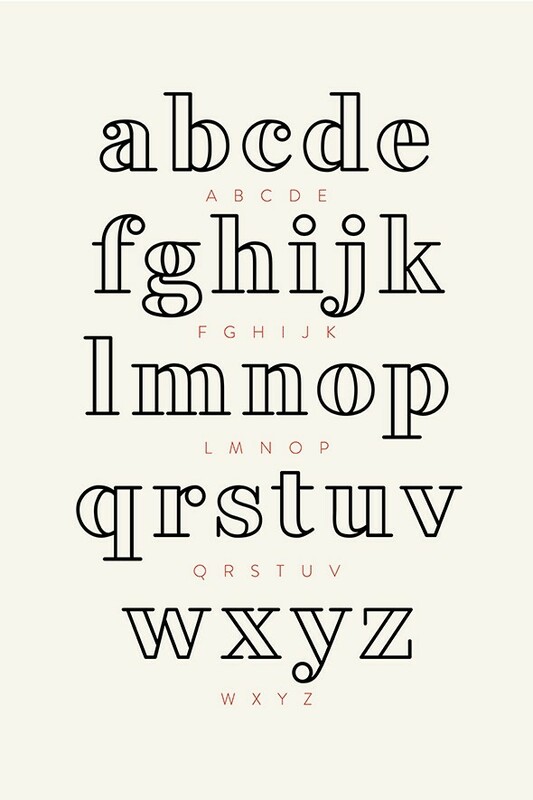 Beautiful, joyful, thoughtful work! Thanks for sharing. Sooooo great ! Bright, cheerful and super stylish. Overstock huh, who knew? You obviously did. Any chance you could share sources on the pillows? Have such trouble putting those together and this combo is just perfect ! Cutest space ever!! Great job!! 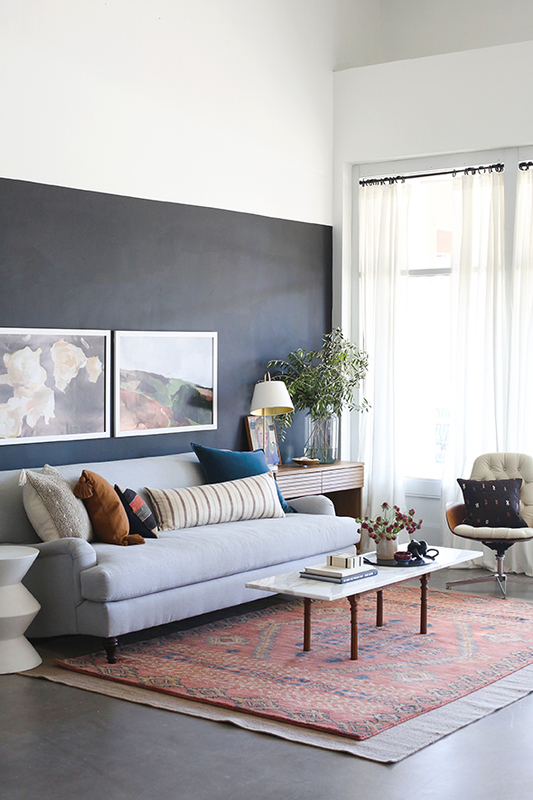 When you say you painted the walls bright white, what exactly is that? I need to freshen up my walls!! 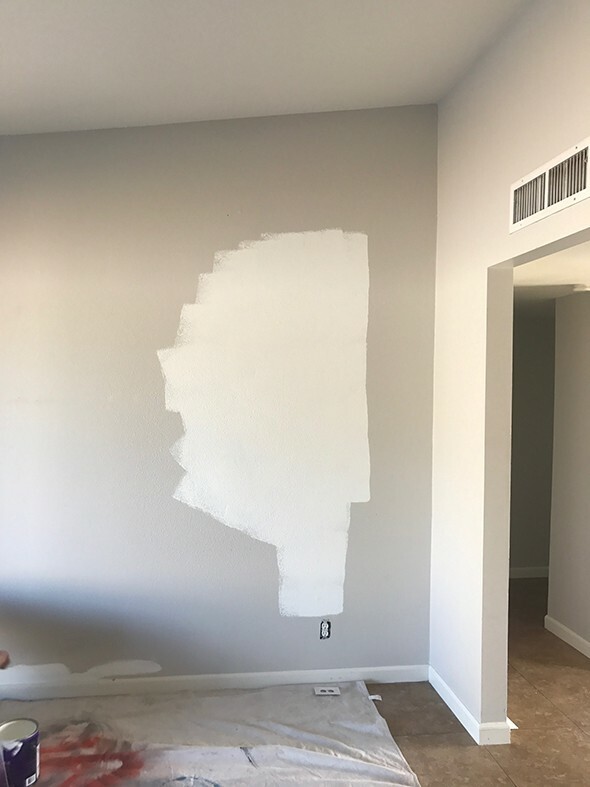 Yes, I would love to know which white paint you used too…I’m so lacking in the design and redo department…so I always put my trust in your ideas and suggestions. You never fail to deliver!! Just awesome. And that last photo is really lovely. Now at the risk of sounding completely tacky…how about Craigslisting your old chairs and tall (Ikea?) bookshelves. What? It doesn’t hurt to ask, right? I’m loving ALL of the pillows, I mean OMG! Would you mind sourcing them? So, so beautiful! I love how happy/touched the owner looks ! 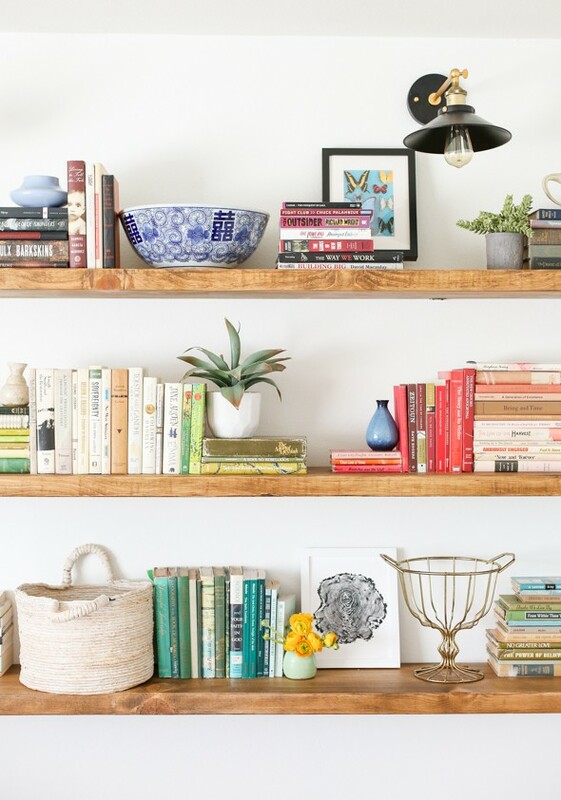 I’m inspired to try and do a similar set of shelves in my office and I have a few (okay maybe a lot!) of questions. How deep are the shelves- 12″? 4″ L brackets and 1.5″ braces? I can’t tell, did you paint the braces with black or another color to blend them in? How did you decide the height of the first shelf from the floor and then the height between the next two sets of shelves? 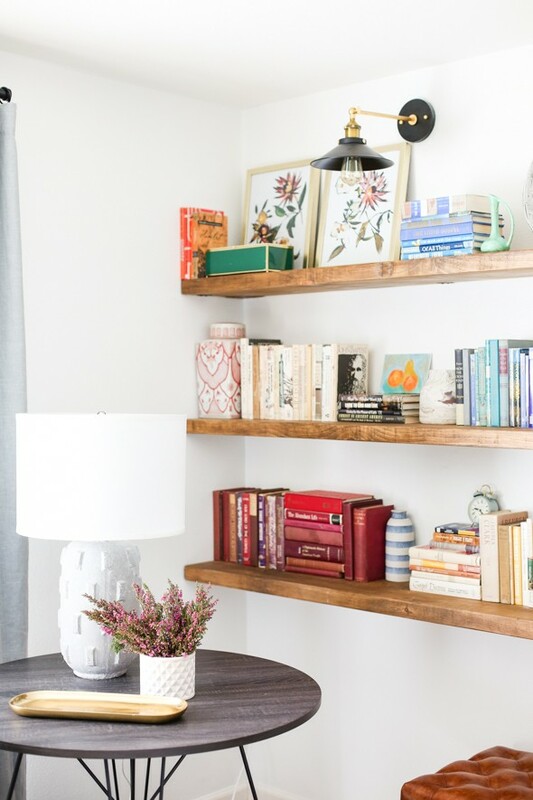 Yes, the shelves are 12″ deep. 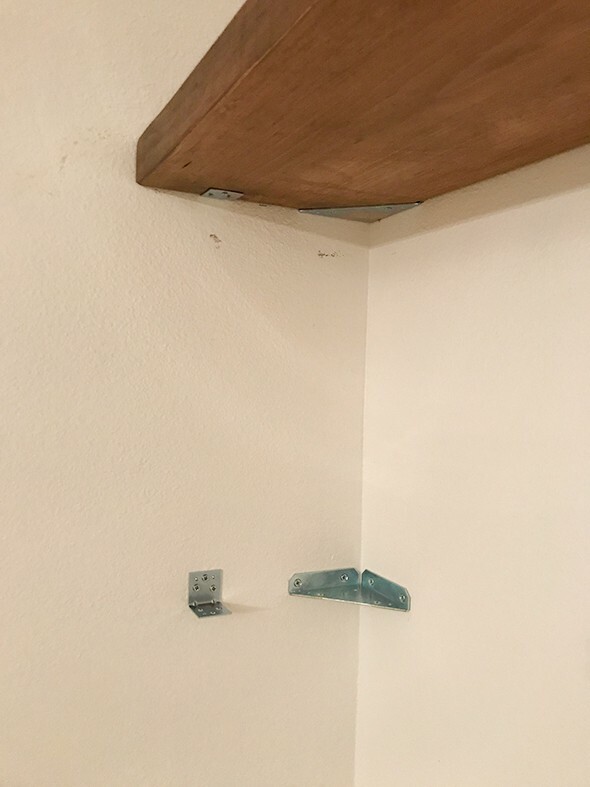 The corner brackets are about 4″ wide I think and the brackets were 1.5″ so they would be hidden behind the 2″ thick planks. We painted the braces a dark brown that matched the stain pretty closely and that helped a lot! 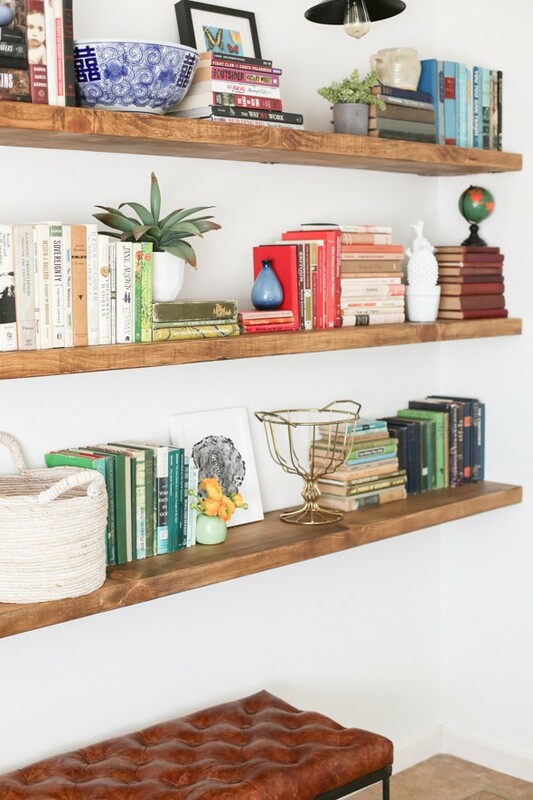 I just sent this picture to my husband… we need these shelves. Did you make them yourself? What is the stain color? Thanks for all the sizing info from the previous comment. This is a room I would want to copy piece for piece in my own home, and I can’t think of another time I felt that way. LOVE it! I echo all the comments. This is gorgeous! 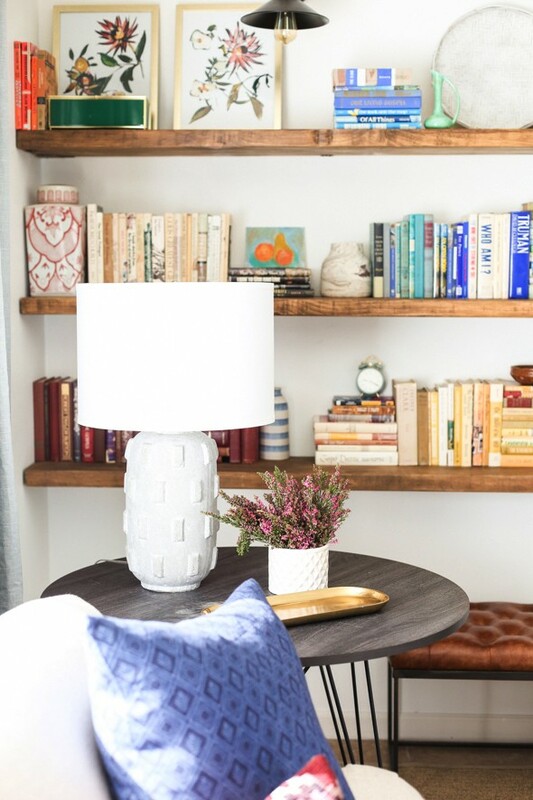 Would you mind letting us know where that white lamp is from? And the pillows too!! Thanks and merry xmas! These two rooms blew me away! The best part is your joy in giving such an awesome gift, though. The shelves are amazing, and I really appreciate all the helpful info on execution. I’m going to check out that beautiful rug right after I stop commenting. 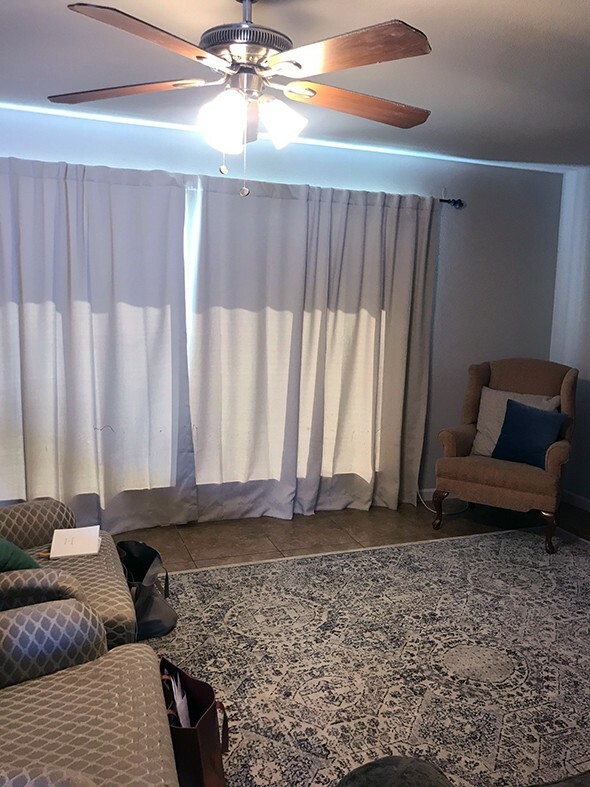 Also–those curtains! 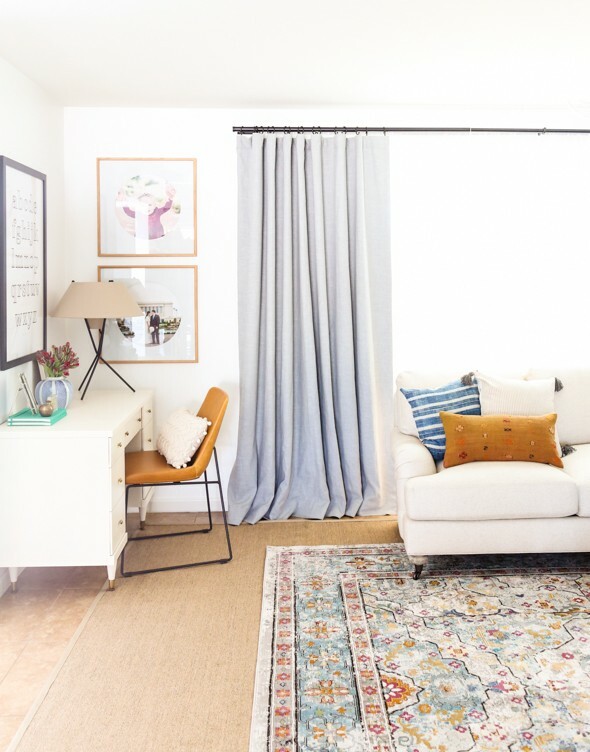 I’m heading back into your blog to see if you’ve done a post about choosing curtains; if not, maybe you would consider it? Geez, that’s unelbievable. Kudos and such. amazing, just amazing! 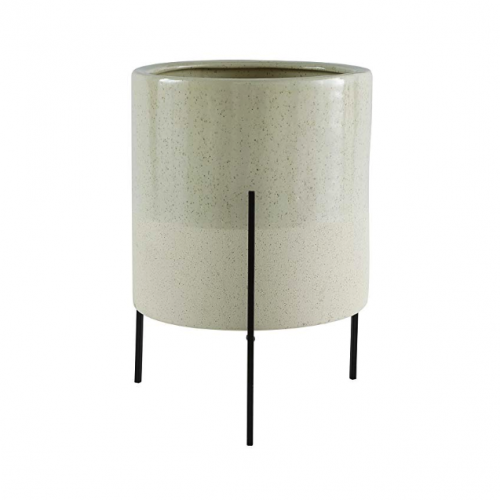 mind sharing source for lamp on side table? thank you! love love love everything!! even down to the twinning outfits at the revel!! HI! This reveal is so pretty. Great job! I’d like to know the off-white color of the desk if you have it. I love warm white with brass. So gorgeous! I have desk similar to the one you painted for this family. It’s on my to-do list to paint. Any tips? Things not to do? Can you share where you got the woven basket under the bench? I’d also love to know where you got that blue and white striped blanket. Thank you! This space is beautiful! 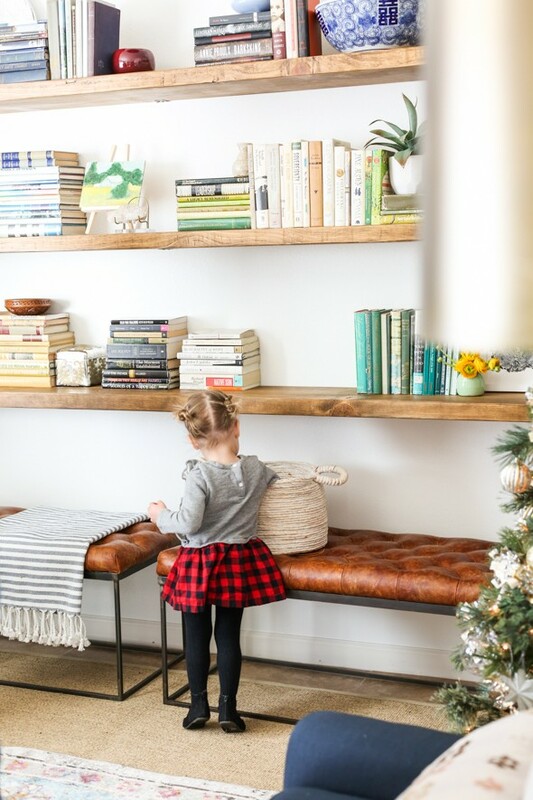 I LOVE those shelves, leather benches, and round tables. Thank you for making a space with truly kid-friendly considerations! I’ve seen designers create rooms that they describe as “kid-friendly” and then there are sharp corners everywhere. My daughter slipped and fell forehead-first onto a corner of a wooden bench once, which ended up with stitches at the ER. 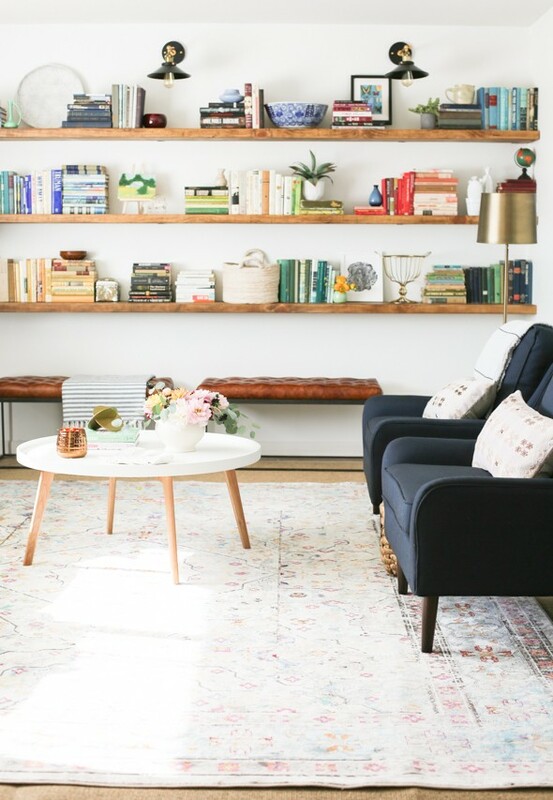 This is truly a beautiful, family-friendly space! Such a lucky family! Hi Jenny! I always search your site for product recommendations before I head into the store. 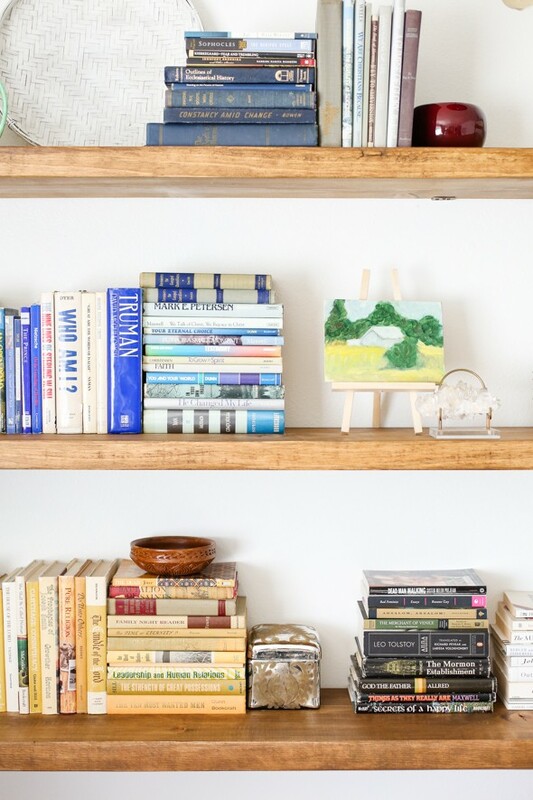 I am tackling similar shelves and trying to decide on a stain, I do see that you have two colors of the gel stain in the picture, did you use both or end up preferring one? I was leaning towards more of a walnut but curious what you used….and this may be obvious but the gel is oil based? Thanks!! The Walnut was a little dark so I used about half and half with natural! I’m not sure if it’s water or oil based? I think water actually? 2. Metal Casting: die casting, sand casting, gravity casting, low pressure casting, investment casting (lost wax casting), lost foam casting, shell mold casting, vacuum casting and precision casting. 3. Metal Fabrication: sheet metal fabrication, metal forging, metal cutting, CNC machining, metal stamping, rolling/bending/forming, metal welding, heat treatment, surface treatment, assembly‎. Beautiful! 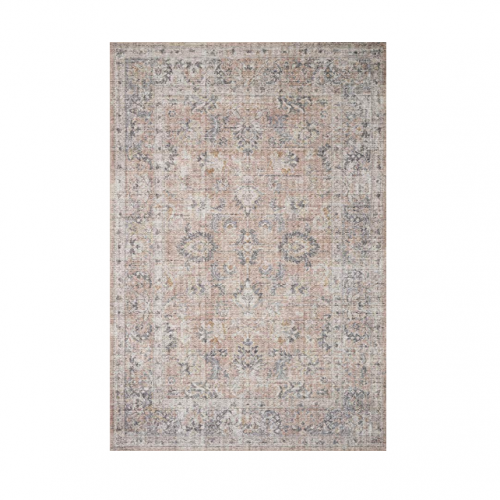 I am considering buying the livingroom rug you used…but then the small blue rug in the entry caught my eye! I have searched and cannoy see a link. Where is it from? 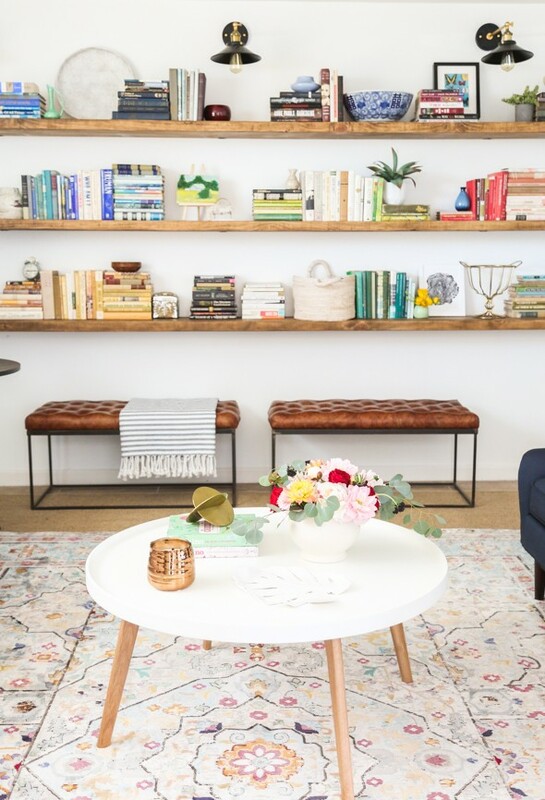 Office Makeover with BEHR’s 2018 Color of the Year! 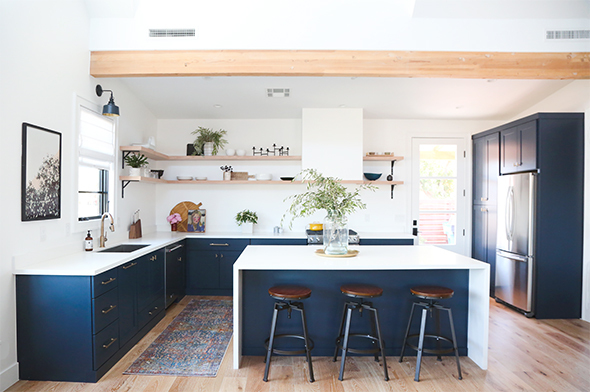 The Gentry Project Kitchen Reveal with Bosch! 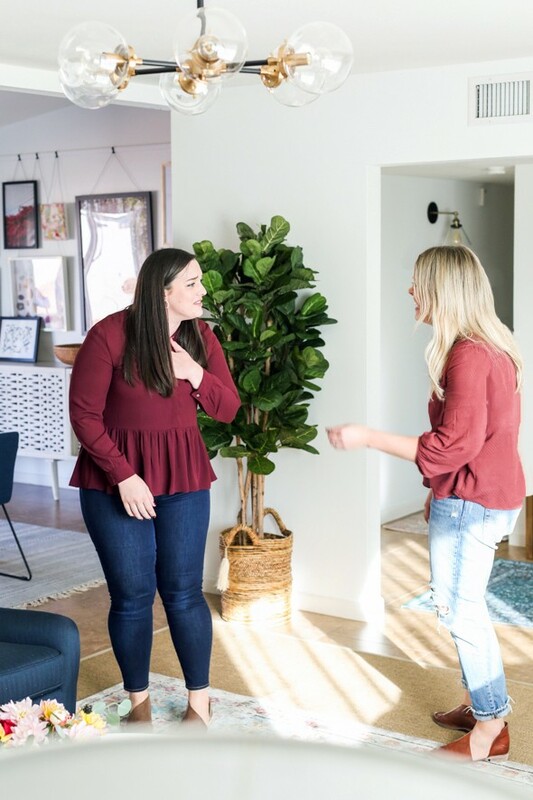 Holiday Shopping with RetailMeNot and a $500 Giveaway!